Convert your bath into a luxury hydrotherapy spa bath. Air Spa systems create a relaxing bubbly sensation from the touch of a button! Small chrome Air Spa jets release streams of tiny air bubbles from the base of the bath. Suitable for the competent D.I.Yer, this self fit Air Spa system is designed to be quick and easy to fit. 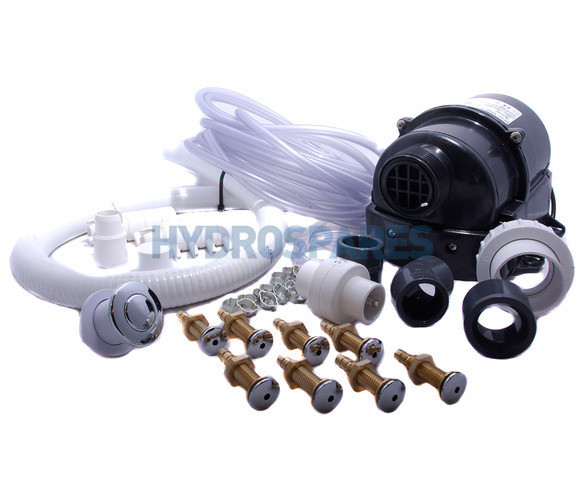 This kit contains 8 x high quality Air Spa jets in polished chrome, these are designed to fit into the base of the bath and release the air bubbles up through your bath water. The controls are simple yet effective. A slim low profile pneumatic On/Off switch in a polished chrome finish provides control to operate the blower.